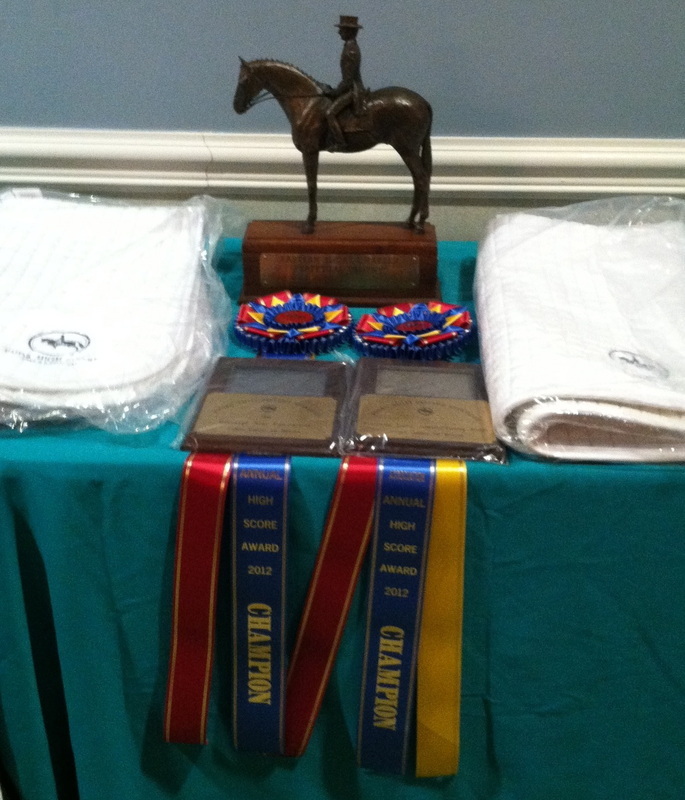 2015 Awards- It was another great year for everyone at Straton Sporthorses! Congratulations to Courtney Peiffer and Cowboy on earning Year End Reserve Champion Open Training Level, Mary Pat Hedges and Tinkerbelle placed 12th in the AA Training Level, and Jennifer Neemann and Safira were 3rd in the AA Intro Level Division. Safira also earned the BRAHA Reserve Champion High-Point Award for dressage. Congratulations ladies! 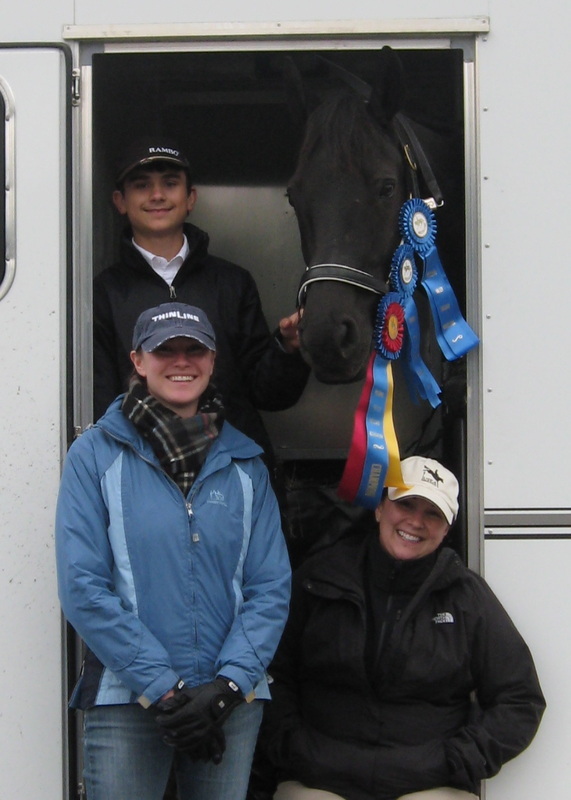 Kudos also to Alice Altstatt and Zahira on a great first season together, Barbara Tennant for a very successful first dressage show, and Kerri Long on a great start to her mare, Kona's, show career! On December 12th & 13th Katie and students Courtney and Mary Pat participated in a clinic with JJ Tate at Spring Brook Farm. This was Katie's first outing with her new grand prix horse, Theo, and JJ was pleased with their progress! Everyone had great rides, many other students came to audit, and as always it was a fun weekend! Several Straton Sporthorses students participated in the PVDA New Market Chapter Clinic with Ashley Perkins in November. The NMC hosted this event at Sunset Ridge Farm and opened the clinic to all for auditing. Everyone enjoyed Ashley's teaching and the NMC hopes to have her return in the future! Students Jennifer Neeman, Courtney Peiffer, and Mary Pat Hedges, along with Katie and fellow NMC member Fran Flohr made up two teams from the PVDA New Market Chapter who competed at the Annual Chapter Challenge. 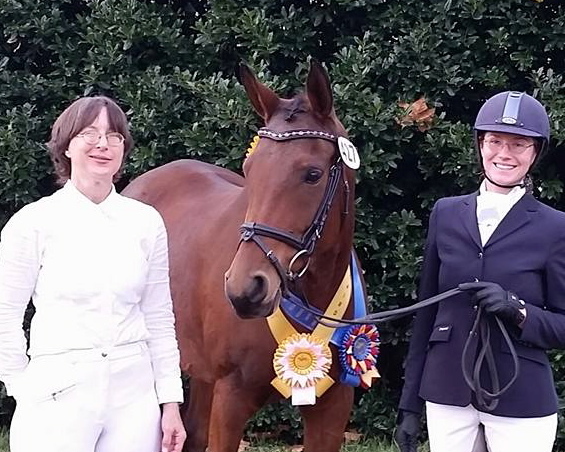 Katie rode Safira on the winning Training Level team along with Mary Pat and Courtney, and rode Alice Altstatt's Zahira on the the 3rd place Intro Team along side Jen and Fran. This show is always a great time! 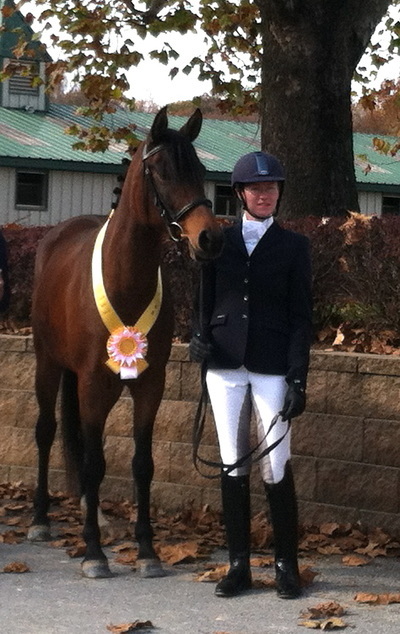 Laura Fisher's beautiful Drum mare, Kitty, won both of her Intro classes at her first schooling show with Katie. The same score of 71.5% in both tests! OPEN HOUSE Saturday October 25th! 12-4pm. Join us for an afternoon party with refreshments, gifts and prizes. Meet our team and tour the facility! 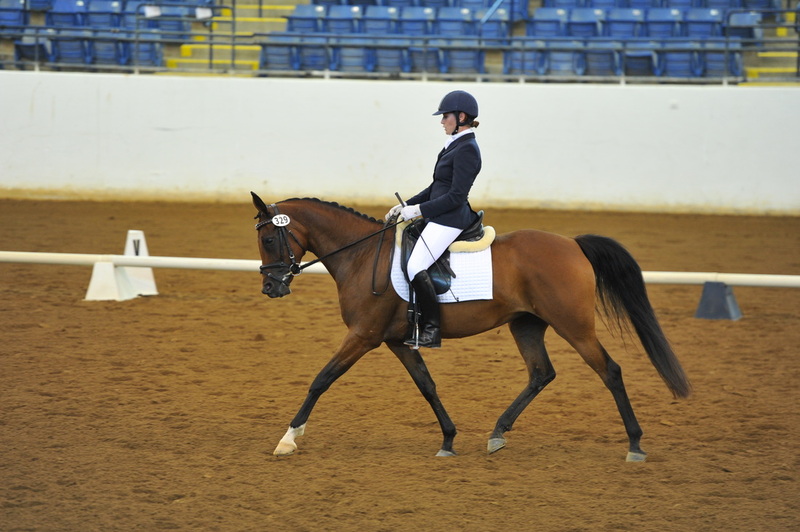 Safira had a great test at the CBLM Championships earning a 69.8%! This placed her mid-pack in huge class of over 30 horses, but she showed us she can hang with the warmbloods! What a great way to end the season with this promising mare! Congratulations to student Mary-Pat Hedges and Tinkerbell on another Reserve Champion with scores in the 70's at the PVDA Potomac Riverside show! Well done ladies!! 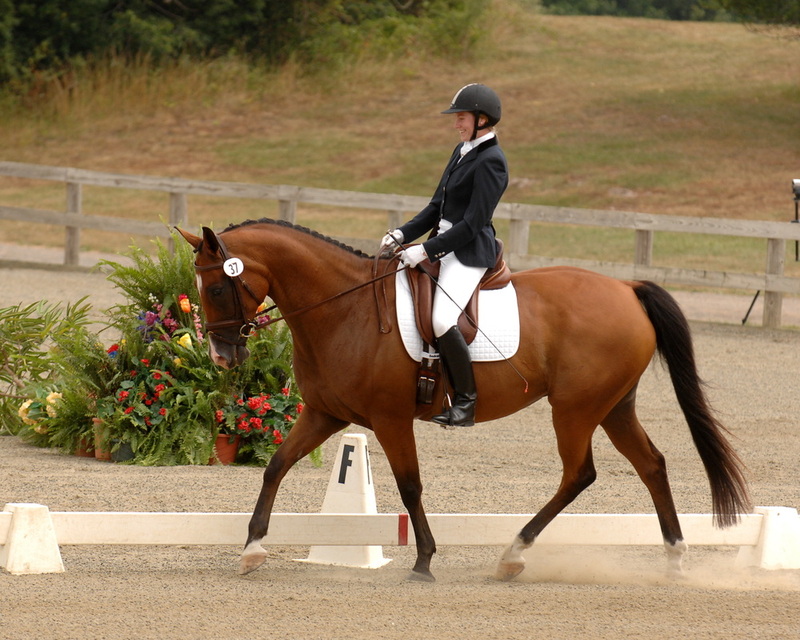 Katie and Golden Safira had a solid Training 3 test at the PVDA Loch Moy II show on August 31st for a 66.2%. "Our warm up was amazing, but unfortunately too long. 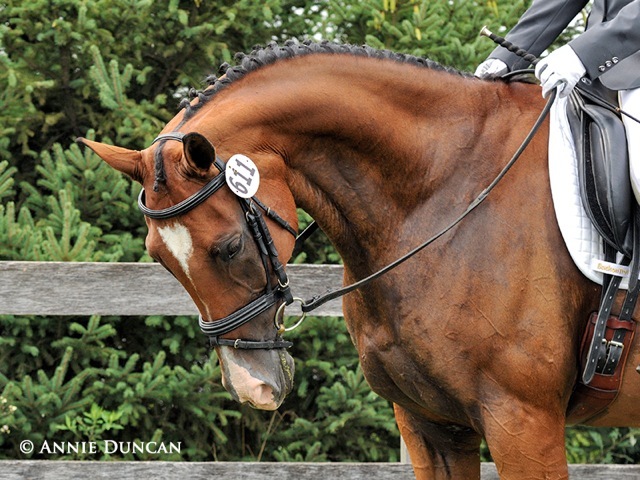 I'm so proud of how this mare has progressed over this season, and am really excited for her future!" Next stop, BLM's!! We are pleased to present a clinic with JJ Tate on Wednesday, August 20th from 2-8pm. A few ride spots are available, and auditing is free. Snacks and drinks will be provided, and we have plenty of seating. Please contact us for more information! Katie, Golden Safira, and owner Jennifer Neemann headed down to Middleburg, VA for the CDCTA Glenwood show August 16th & 17th. 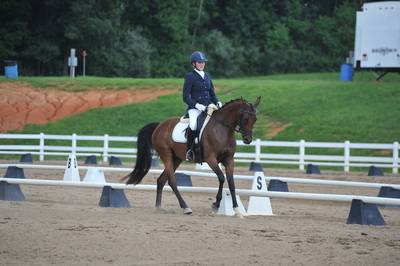 Safira was a star and earned her highest score yet of 69.8% in Training 3! Steady improvement at their 2nd recognized show together! Our home show, the PVDA Morgan Run schooling show on August 10th, was a great time! We had perfect weather and thanks to everyone at Morgan Run, and PVDA's volunteers, it was a well run show! Katie rode Safira in T2 & T3 as a prep for their recognized show next weekend, and student Mary-Pat Hedges earned another Intro Level Champion with scores over 79%! 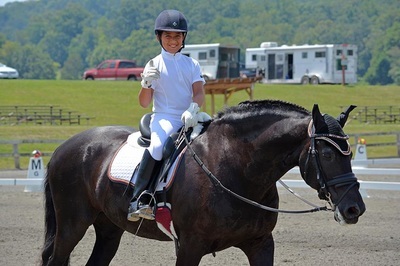 Liberty Belle and Katie competed at the Blue Goose dressage show on August 6th earning another score over 69% at her second ever recognized dressage show. A rider mistake resulted in a low score for their second ride, but this wonderful mare has otherwise been consistently scoring 68-69%! Belle is still for sale and ready to win with her next rider! Check out her info on our sales page! July 25th we welcomed saddle fitter and Trilogy rep, Adrienne Wisenburg for our "Ladies Night" at the barn. Adrienne demonstrated her saddle fitting skills and showed us the fabulous Trilogy line of saddles while we enjoyed wine and snacks. It was a fun night, and we can't wait to have her back for more fittings! Every horse in the barn should have one of these saddles! 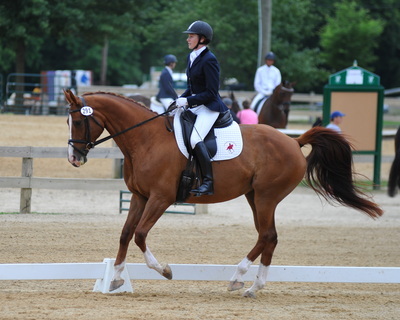 Congratulations to student Mary-Pat Hedges on her great rides at the FADS By Chance show on July 13th. 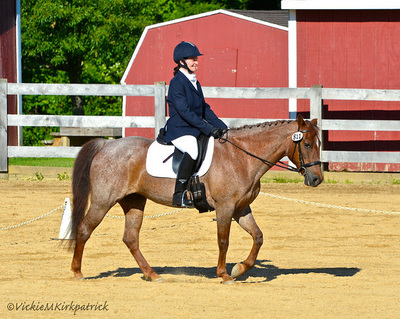 She and Tinkerbell have made great improvements in their focus and relaxation since their first show. Great job! We welcomed Richard Malmgren on July 11th to work with some of the horses on long lines. It was a fabulous experience for all of the horses and we look forward to having Richard back frequently and incorporating this into our training program. If you're interested in watching or participating please contact us! Katie took Liberty Belle and Golden Safira to the PVDA Ride for Life show on June 21st-22nd. 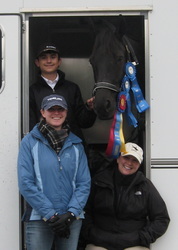 This was Belle's first recognized dressage show ever, and first for Katie and Safira together. It was a busy weekend with both horses in the same classes, but the girls were super, even taking 1st and 2nd place in the Sunday T2 class. For our June 13th "Ladies Night" we invited guest speaker Rebecca Douglass, of Acupoint Therapies, for a presentation on the benefits of acupuncture and a demonstration. It was a fun and informative night, and the horses certainly enjoyed it! 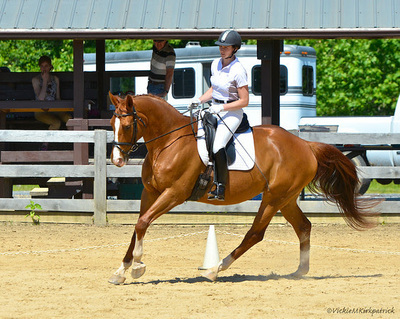 We had a successful first outing of the show season on June 7th at PVDA's Schooley Mill show. 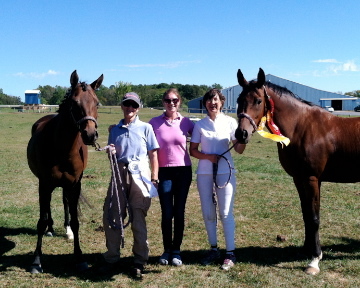 Katie rode Liberty Belle and Golden Safira in Training Level tests 2 & 3, and student Mary-Pat Hedges rode her mare Tinkerbell in Intro A & B at their first dressage show ever. We came home with lots of ribbons and a Training Level Champion for Belle, and Intro Level Reserve Champion for Tinkerbell and Mary-Pat! Thanks to the wonderful team of owners, grooms, and friends who helped out a this show!! Thank you to everyone who attended our first "Ladies Night" event on May 2nd to visit our new facility and plan our show schedule for the year. We are looking forward to a successful season! On April 1st we opened our doors at Morgan Run Stables, beginning a new chapter for Straton Sporthorses. We are very excited for our future at this wonderful facility! We welcome our clients and friends to join us and thank them for their support and trust in our team!! Contact us to find out about our expanded services or to visit the facility! Thanks to a scholarship from PVDA, Katie had the opportunity to travel to FL to train with JJ Tate and compete aboard Sophie Ghedin's gelding, Remy, where she earned her final scores for her USDF Bronze medal. Way to go! Katie and Belle finished out the show season November 3rd at the PVDA Chapter Challenge show where their Metro/New Market team won Training Level 3 Champion! 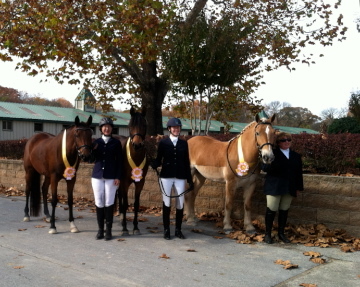 Belle was also successful at PVDA's Celebration Farm show in October with two scores in the 70's! 3yo Sovereign Song went to his first show in August, the VADA/NOVA Summer Breed show, where he placed 2nd in the 3yo Colts/Geldings class, 3rd in the Colts/Geldings Championship, 2nd in the GOV class, and 1st in the Amateur Handler class, with all scores in the 70's!! We are so proud of this handsome boy and can't wait to see what the future brings! Congratulations to student Kelly Thiel on her purchase of the Oldenburg gelding, Solar Eclipse (by San Diego-Sandro). This kind and lovely schoolmaster is proving to be the perfect match. We welcome him to the team and look forward to a successful 2013 season! Katie and Solar Rose, her 5yo SWB mare, were thrilled to participate in the young horse clinic with Dr. Ulf Moeller on November 10th at GoodNess Ridge Farm. It was an exciting opportunity to ride and watch such quality horses! We finished off the show year at the PVDA Schooley Mill JR/YR, and Sugarloaf schooling shows in October. 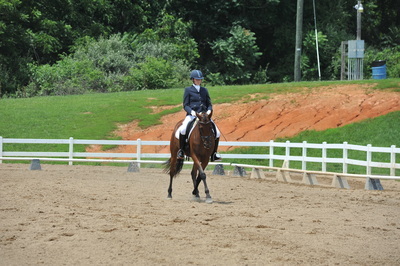 Josh Collier and HR earned Training Level High Score again with a 78.2%, their personal best! Congratulations on a great season!! Congratulations to student Josh Collier on a successful day at the PVDA Jr/YR Schooley Mill show August 18th! Josh and Hotrod won both Training 2 & 3 with 70.3% & 73.6%, and Training Level High Score!! 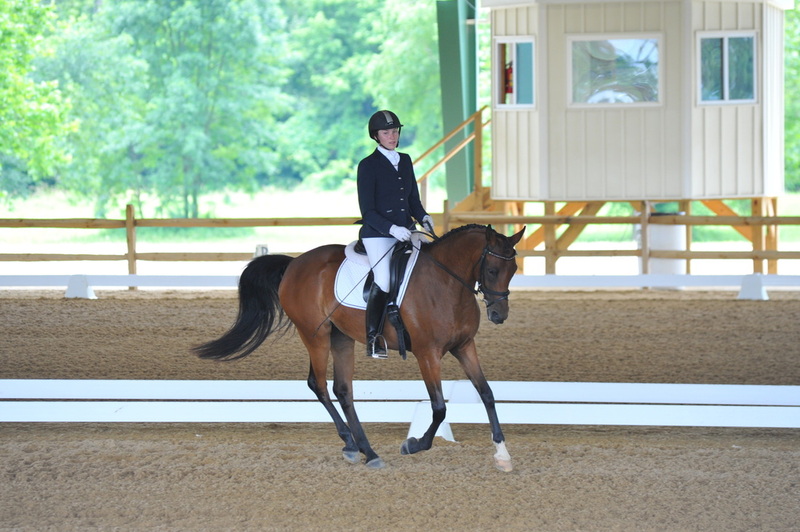 They also tried out the Dressage Seat Equitation class where they tied for 1st with one other competitor, and received super feedback from the judge! Mary Sue and Finney put in a solid test at Blue Goose on August 8th, earning a 62.4% in a huge class. Great job!! On July 29th, junior student, Joshua Collier, went to the PVDA schooling show at CDI, his first show of the season (and second dressage show ever). He and his horse, Hotrod, earned a 68.4% in Training 3 for 3rd place, and a 72.86% in Training 2 for 1st place and the Training Level High Score!! Mary Sue and Katie headed down to Lexington, VA with Finney on July 6th for the Arabian Horse Association Region 15 Championships. It was a fun weekend visiting my family and experiencing a whole different type of horse show! The competition was tough, and with only one test to ride the whole weekend, there was a lot of pressure. Despite a little set back from the extreme heat, Finney and Mary Sue had a great test, scoring only 0.2 behind Champion, and earning a Top 5 placing! Congratulations to student Mary Sue McCarthy and Finnegan's Wake on earning BLM and GAIG qualifying scores for Training level, and winning the Overall High Score Adult Amateur Award with a 72% at Dressage at Fair Hill on June 9th!! 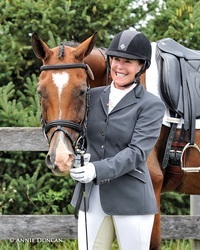 In February, Katie and her mother-in-law, Diane Danielson, acquired a new dressage prospect! Sovereign Song is a 2yo Premium GOV colt (soon to be gelding) by Soprano. 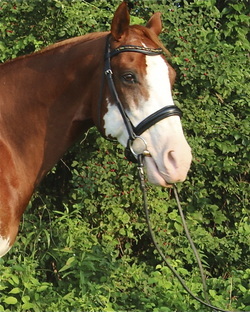 This tall, handsome boy has a kind, quiet temperament, and is a quick learner. Look for more news on him in the future! Katie and Finnegan's Wake, owned by Mary Sue McCarthy, were selected to ride in the Charles de Kunffy clinic again at Hassler Dressage on February 11 and 12. It was a wonderfully inspiring way to start off the new year! 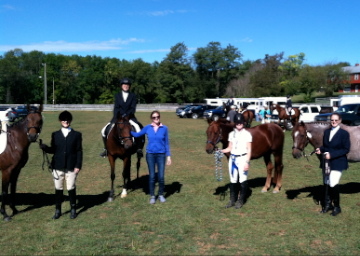 Our team of four riders from Windy Oak Farm competed in the PVDA Chapter Challenge on November 7th to a second place finish in First level test 3. It was a fun show, and first for my mount, as well as one of the riders. Our youngest team member, Josh Collier, who had the highest score on the team! Congratulations to all on a great team effort! 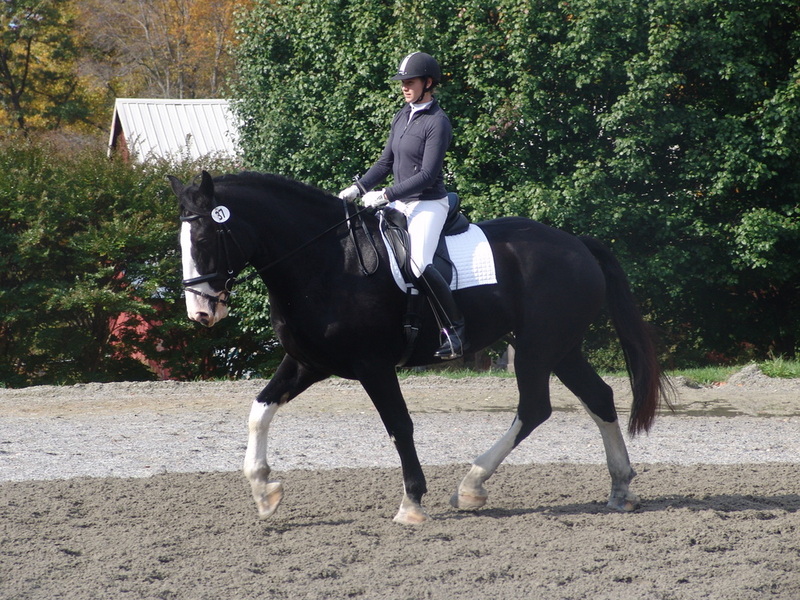 Mercedes, a 5yo Shire mare owned by Laura Fisher, went to her first show on October 23rd at Pleasant Ridge where we scored a 72.5% and 71.2% for the highest scores of the show! On September 17th I took Lilly and Finney to the PVDA Loch Moy show. It was a very busy morning with four rides in two hours. Lilly earned a 65.3% for another 2nd place at Training level and Finney earned a 63.7% and a 65.8% for 3rd and 4th place at First level. It was a successful day despite the rain! Thanks to Finney's mom, Mary Sue, for running a great show! Lilly scored a 64.6% in Training 2 at Morven on the September 10th Vada/Nova show. This was her first show of the season and she was like an old pro! So easy and quiet! Check her out on the sales page. More pictures coming soon. Mary Sue and I took a day trip to the EEMI Summer Fling on August 6th at Morven Park where I scored a 65.4% in First 3 with Finney. We had a great time at the Pas de Deux challenge (despite the rain)! Katie rode Mary Sue McCarthy's, Finnegan's Wake at the PVDA Ride for Life in his First Level debut and qualified for the BLM Championships! 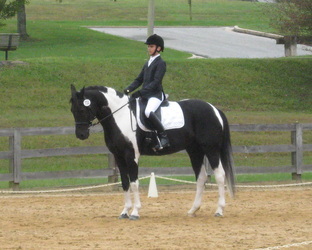 Rebekah Lusk also successfully competed at First Level in her first licensed competition. It was a fun weekend for the Windy Oak Team! 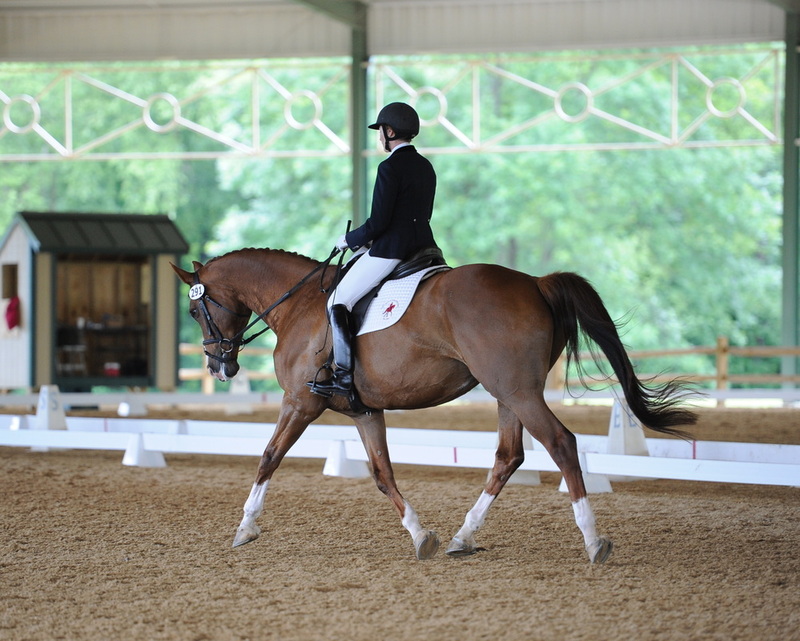 The Charles de Kunffy clinic at Hassler Dressage was an amazing weekend! As always, Charles was so inspiring and motivating. I am excited that Windy Oak owners, Steve and Rebekah, could attend and learn from such a great master! Thanks to Mary Sue for making this possible! Katie attended the VADA New Test clinic with Linda Zang at Morven Park on April 23. This was a great opportunity to see the new tests ridden and judged, with helpful tips on working through problem areas. 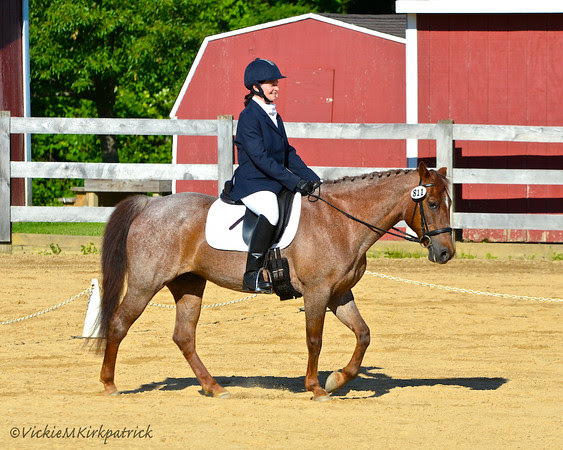 Katie has been selected to ride in the Charles de Kunffy clinic May 14 & 15 at Hassler Dressage on Mary Sue McCarthy's gelding, Finnegan's Wake! Welcome to Mary Sue and Finney who are now stabled at Windy Oak Farm. 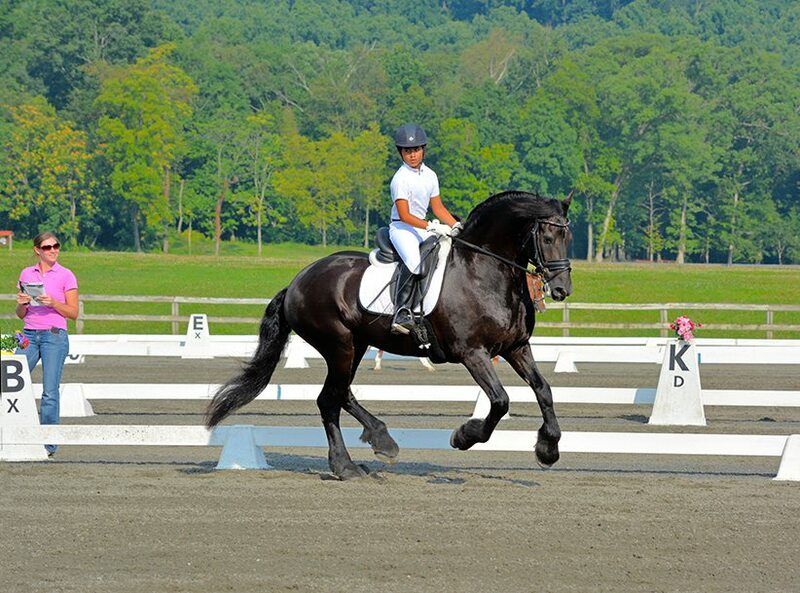 Straton Sporthorses is proud to announce that Katie is now sponsored by Gunnar Galleries of Gettysburg, PA! Please visit their site www.gunnargalleries.com. For information on how to become a sponsor and what type of sponsorship is needed, please contact Katie. Katie and Rebekah Lusk attended the PVDA Tea For Training to learn about volunteering (and nutrition!). We each went to different classes and later compared notes. We also really enjoyed the nutrition lecture put on by Nutrena and arranged to have them visit the farm and help with our feeding program at Windy Oak. Part-time working student needed to help with grooming and tacking etc. in exchange for lessons. More riding is a possibility based on experience. Great opportunity for student!